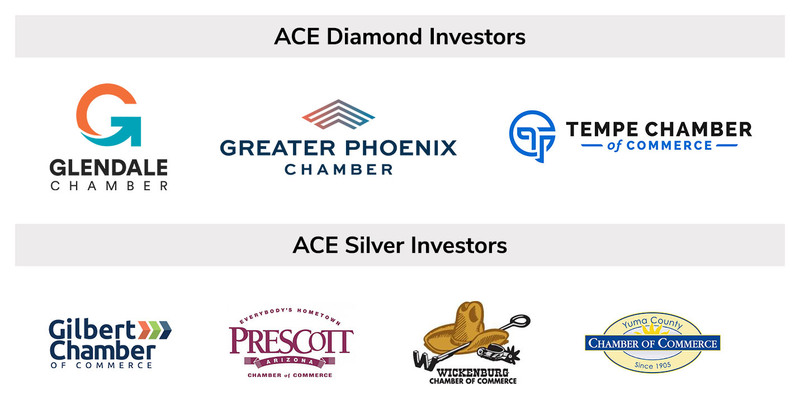 Arizona Chamber Executives (ACE) is a nonprofit organization assisting chamber executives throughout Arizona to become informed, effective leaders in their communities. Through conferences, newsletters, networking, scholarships and an online resource library, ACE provides information, counsel and training to equip chamber executives as they face daily challenges in business, economic, social, political and educational arenas. ACE provides a forum to enhance the professional development image of chamber executives and staff. It provides an avenue for all chambers across the state to work together on state, federal and local issues. Thank you to our Chamber member investors for 2019!